Discover the Power of Email Marketing for eCommerce Today! Increase the profitability of your ecommerce site with email marketing. It's not just another revenue channel, it's a channel you own! Unlike most email marketing courses, we're not gonna show you how to drive real-estate leads or digital sales signups. We're ecommerce guys and we'll show you how to leverage email marketing SPECIFICALLY for eCommerce. The Email Marketing for eCommerce course is divided into 10 modules of content, with video lessons, resources and tool recommendations in each one. Every module provides you with further instruction to help you start collecting, segmenting, and using your email list to drive profits for your eCommerce site. 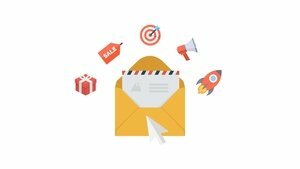 Learn why is email marketing important for your eCommerce site. Learn the basics of email marketing, terminology, and best practices. Learn how to write engaging emails that bring new customers in and old customers back. Learn about autoresponders, how to use them and which one we like to use. Learn why it's important to track what you do and how to do that with email marketing. Learn some basic campaigns every ecommerce site should be running right now to make more money. Learn how to predictably build large email lists of engaged and ready to buy customers. Learn about email funnels, which ones we recommend for ecommerce and how to use them. Learn why it is important to segment your list and how we use it to our advantage for higher profits. Congrats your are done, now what. Listen as Jon explains! Gain access to our members only community full of other eCommerce site owners ready to network & help each other grow. If you run into troubles, rest assured you have our direct support via the community and email. Our staff is ready to help!